Oh Hey There! : Review || The Body Shop 'Camomile Silky Cleansing Oil'. 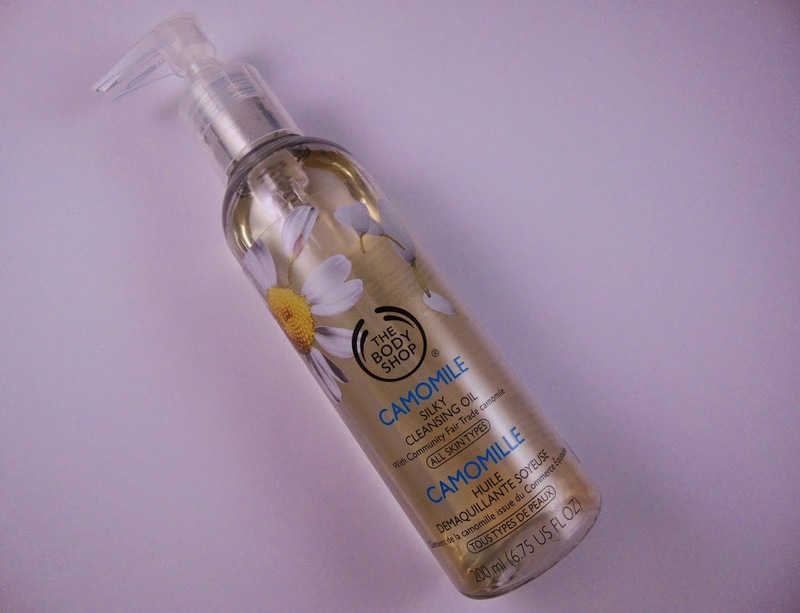 Review || The Body Shop 'Camomile Silky Cleansing Oil'. I have been using this product for a few months now and I am really impressed with it. Cleansing Oils are something that have been around for a while now and there are a lot of people who swear by them. I myself have definitely become a convert, after using The Body Shop Camomile Silky Cleansing Oil. I think it is a really easy to use product and is suitable for all skin types. I use it both in the morning and the evening to cleanse and remove makeup and I am really impressed with the results. The reason cleansing oils are so effective, is that the oil binds to dirt or makeup already on the skin and making them easier to wash away. They are also better for your skins health as non-oil based cleansers can be very harsh on skin, causing irritation. They also strip the skin of all of its natural oils, forcing it to go into overdrive and produce excess oils in order to compensate. This can cause multiple problems, including blemishes and oily skin. Whereas, cleansing oils keep the skins PH balanced. Many essential oils are also naturally bacterial. The first time I used the Camomile Silky Cleansing Oil, I was shocked at how effectively it removed makeup. It really does just melt it away from the skin in a matter of seconds. After application and massaging to help lift any dirt or makeup. I then add a little water, which makes the product lather slightly and then wash my face with running water. Although you may imagine that an oil may be quite heavy and difficult to remove it is very light and washes off very easily. Afterwards, my skin not only feels clean and refreshed, it also feels a little nourished, which non-oil cleansers rarely do. I am also really happy with the Camomile Silky Cleansing Oil as it is very gentle and I have found that my skin has been less irritated since using. I also suffer with a lot of redness on my skin and I have found that it has helped to calm it down. Overall I really do recommend this product and it has become a solid staple in my skincare collection. It definitely makes me want to try more and more cleansing oils and I really think is a great product for someone who is just starting to explore cleansing oils but still wants good quality does not want to spend too much. Are you a fan of cleansing oils? I love cleansing oils! I tried this one out and I like it! I haven't used a cleansing oil yet! But I've been using Body shop's Camomille balm for almost a year as a cleanser/make up remover and I'm really happy with it! i've never tried a cleansing oil but i've heard so many good things about this one so i really want to try it, nice post! I'm currently using the Cleansing oil right now but I find that it irritates my eyes when removing my makeup, so I purchased the cleansing balm and that really works for. In the end I've established that I'm a really big fan of cleansing balms rather than oils <3 Happy Days!